Today was my laze around and do nothing day. Yeah, I went to another country to watch TV and Plurk. Get over it. Despite my plan to sleep early last night, I ended up sleeping past midnight, since it took me almost six hours to finish that one blog entry (including editing photos, uploading and many breaks in between). I relished the fact that I didn’t have anything planned, and enjoyed my sleep until 9am. View from my window: another window. I went down for breakfast, again at Mandalay Inn’s own restaurat. I order the same fried rice that I had at that Khmer family restaurant inside the Angkor Heritage Park yesterday, but this time with pork instead of beef. I brought my laptop with me and took my time eating my breakfast as I catch up on e-mail, blog comments, Plurk, flickr and RSS subscriptions. I finish around lunch time, and went up back to my room. I meant to walk around the town, but since it was still too hot to be walking anywhere, I stayed inside my room, relishing the gentle breeze from outside the window and from my room’s ceiling fan, indulging myself with Discovery Channel shows. About half past two, I finally got up and went out to the street. The sun was once again in full force. 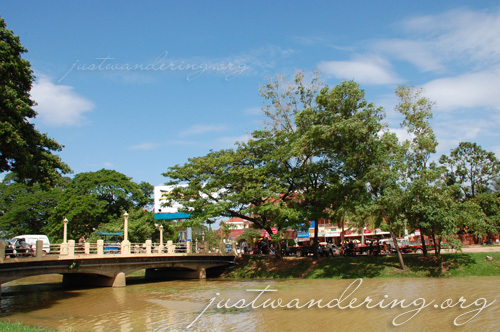 I cross the street, walking parallel to the Siem Reap river. Aside from checking out the market, I also wanted to change my US$100 to smaller bills, since I don’t have enough for the US$30 taxi ride to Poipet tomorrow. Luckily, there’s a bank right across the Old Market, and I go in to ask if they can accommodate my request. They can, and after checking the bill’s authenticity, the teller went to the vault and came back with a wad of tens and ones. Oh, funny note: while I was waiting for the teller, I was looking around the bank’s interiors. There was a huge sign with the interests for different time periods and different kinds of accounts. There was a section for dollar accounts, riel accounts, baht accounts and GOLD. Wow. The local currency, the Cambodian Riel doesn’t have any coins, nor do they use the US coins. So if you’re supposed to get change less than $1.00, expect to get it in riel (though sometimes you can also get it even if your change is US$5.00). So my other problem is how to get rid of these extra riel when I get out of Cambodia. Though the prices are quoted mostly in US dollars, you can actually ask the seller for the price in riel. The standard exchange rate is US$1 = 4000 riels, but it can change according to which rate favors the seller better. I’m not one for bargaining, so I pretty much just pay whatever price they give me (as long as it’s reasonable). 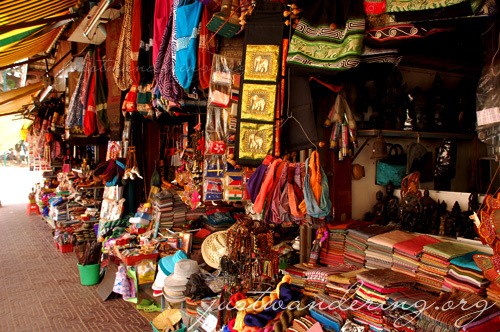 I cross over to the Market, circling the entire block, looking at souvenir items that all look the same. I buy a couple of postcards that I intend to send a couple of friends. The shoplady quoted me $1 each, but for some reason, when I asked her how much for the two postcard, she told me 3,000 riel. Hey, I’m not complaining, as long as I get rid of these riels. Further along, I buy a couple of magnets and bunch of spices to give to Ming whom I’m meeting in Bangkok. On the way back to the guesthouse, I stop by a minimart to look for some snacks. Right next door is an Indian restaurant. I know I should try more Khmer foods, but I just can’t resist a good curry. I only meant to look at the menu, but I was gently pursuaded to order a non-vegetarian lhasi, which is a meal with rice, garlic naan, dahl, pork curry and vegetable curry for US$4. I ordered a mango shake to go with it, as well as a small bottle of water. Back in Manila, I usually just get the regular house water from restaurants, but I didn’t want to risk it while traveling. It’s an additional expense, but hey, better than getting sick. The drinks arrive first, and one sip of my mango shake and I immediately regret it. It’s not *that* bad, but it’s not as good as the mango shakes you can buy off the streets in Manila. There was a bit of a wait for my food, as it’s only cooked when you order. After about 10 minutes, my lhasi arrive and I dig in. It was goooood. I told my server to make it only mild, and it was just right. Except for the vegetable curry, which was slightly spicier than my meat curry. The naan was served a minute after the first plate, and I only taste it after finishing off my rice. Oh man, that naan was fantastic. It was chewy, and had just the right amount of crispiness and it had some chopped garlic and some garlic oil on top for added oomph. It was perfect with the dahl and curry, and even if on its own. That meal was a US$4 well spent. 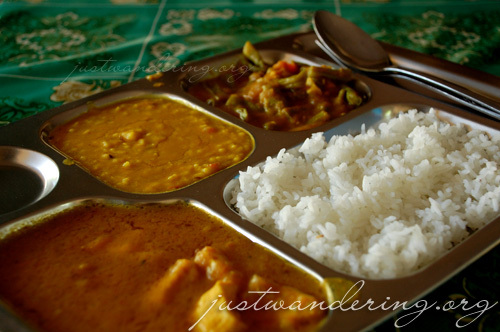 If ever you find yourself craving for Indian food in Siem Reap, head on to Sivatha street and give Indian Gate a try. I walk back to the guesthouse for more Mythbusters, Brainiacs and Miami Ink. There nothing more to write about, so I’ll keep this entry short. I have some tidying up to do in my room, since I’m leaving early tomorrow. Hopefully, the next entry would be written and posted from Bangkok, Thailand. You didn’t head to Tonle Sap lake? 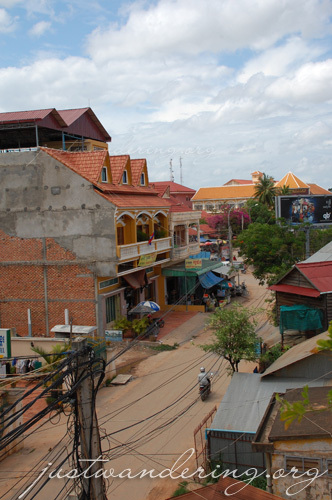 Siem Reap looks very different now from what I recall. There’s paved roads now! seeing the ref magnets, the old market and the indian food made me excited to be there next week. you’re right. mainit nga but i could see in your pics that it’s cloudy. hope it’s better weather there than here. sorry to intrude on your rest day yesterday with all my e-mails. have a safe trip to poipet (heard it’s a scammer’s paradise there) and of course, enjoy bangkok and your other destinations. Just discovered your blog. Great photography! 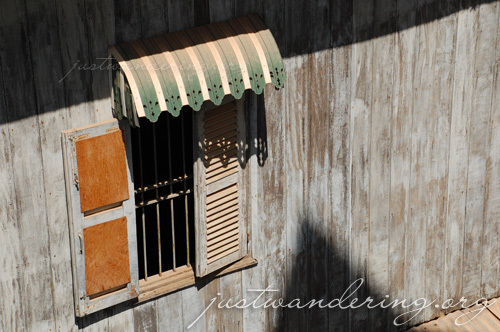 Hoping to wander through more of your blog posts in the coming weeks! I agree with Wei! Seam Reap looks different. A lot “cleaner” I may say. hehe. I recognize some of the streets and that store. hahaha. Count me in for being amazed to see paved roads! Although I do recall some construction when I was there. Tonle Sap Lake, if you have the chance to visit next time, is definitely worth the visit. So different from Siem Reap, and wonderful to see the floating villages. I was so fortunate to have visited it with the local NGO to see their community work (and they do great work there ). Ferdz: It’s paved na nga, but there’s still dirt and soil on the side of the road so when the wind blows, sobrang dusty. Muddy naman when it rains. 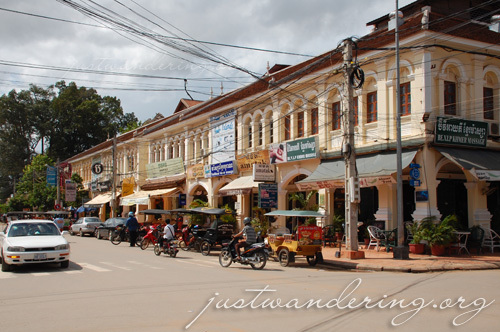 Cayce: Kinda regretting not going to Tonle Sap, or exploring further than Angkor Wat. Definitely coming back for more! Hi. Me and my husband are booked for manila bangkok. We are planning to take a bus to boarder for Cambodia. How much do you think is the budget for a three day stay in cambodia? You think we should get a Mandalay tour package or it is better I just get a hotel and do eating out and the tours? Mnga magkano per head ang dapat ko ihanda just so I have an idea? haha i can relate, 1 1/2 days ata ako na walang ginawa s Siem Reap kundi matulog at kumain at gabi ako nag-ikot dahil natamad ako s sobrang init at pagod. sayang! now ko lng nakita tong mga Siem Reap post mu, very helpful. At yung Mandalay Inn I think asa tapat lang xa ng guesthouse ko! piniktyuran ko pa nga ata xa eh, the next day ko na xa nakita after my arrival kase gabi na ko nakarating. Maganda nga tlaga xa, nakakatuwa yung banner nya “Looks expensive but not”. Mukhang my generator pa ata yan, kse yung guesthouse ko as in wala, eh nung 1st night ko nag brown out pa. tsk tsk. hi nina! 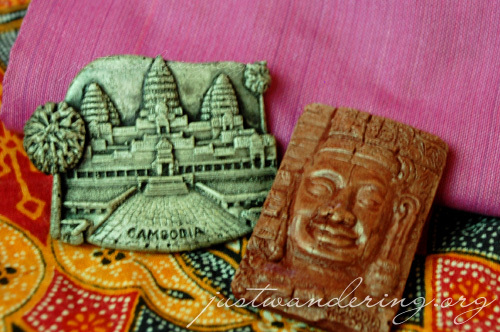 =) im starting research for next year’s cambodia trip. addict? haha i really love your posts especially the post trip accounting, winner! did you ever go to phnom penh? Welcome to Tasty Points in Siem Reap!!! Opening Hours: 11:00 to 22:00 for Lunch and Dinner. Hahaha, glad to know that my post reminded you of good times!